Anime also due out in April 2017. The Snack World will launch for iOS and Android in Japan in April 2017, alongside the premiere of the CG animated series on TV Tokyo, Level-5 announced during its Level-5 Vision 2016 event. The 3DS version will follow in July 2017. 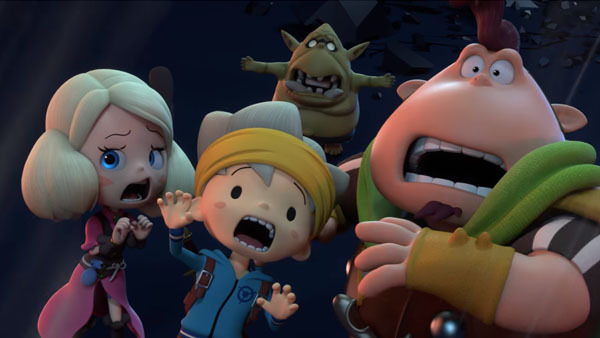 The Snack World is Level-5’s fourth cross-media project following Yo-kai Watch. In addition to the anime and game, a manga for Monthly CoroCoro Comic will launch this winter, and a toy line from Takara Tomy is also planned. The world of The Snack World is made up of the weapon shops and inns of traditional fantasy RPGs in addition to convenience stores, cafes, vending machines, and smartphones, earning it the title of a “hyper casual fantasy” world. Battles are in real-time and use simple controls. You’ll use real-world items called “Jara,” distributed by Takara Tomy, that are equipped with NFC chips readable by the 3DS or smartphone, to unlock the same item in the game. Jara have a number of different brands, including “Britannia Enchant,” “Peffany,” Clanarine,” and “Fairy Electronics.” Read more about The Snack World here. Watch a new trailer, Jara brand videos, and gameplay footage below. View a new set of screenshots at the gallery. Visit the official website here. The Snack World, Level-5’s fourth cross-media project, will be released on Android/iOS devices in April 2017 — and on the Nintendo 3DS platform in July 2017. As its key ‘hyper-casual fantasy’ concept suggests, The Snack World takes place in a typical RPG fantasy setting with weapon shops and inns appearing here and there, while such modern conveniences as corner stores, vending machines, and cafés also exist. Along with the game release, The Snack World TV series will start airing in a primetime slot on TV Tokyo starting in April 2017. The magical adventure of Chup, the main character of the show, and his comrades will be depicted in high-quality, full CG animation. In addition, its monthly serial comic strips will be published by Shogakukan on Coro Coro Comics, and its signature toys — many of which were showcased at “Level-5 Vision 2016” — have been developed by Takara Tomy. As a large cross-media initiative, The Snack World will be rolled-out through other entertainment franchises, too. Its overseas expansion will be handled by Level-5’s subsidiary, Level-5 abby — though this rollout schedule is yet to be determined.